Western blot analysis of whole cell lysates probed with WRN antibody (VPA00006) followed by detection with HRP conjugated Goat anti Rabbit IgG (1/10,000, STAR208P) and visualized on the ChemiDoc MP with 7 second exposure. Arrow points to WRN (molecular weight 200 kDa). WRN antibody recognizes Werner syndrome ATP-dependent helicase, also known as DNA helicase, RecQ-like type 3, RecQ3, exonuclease WRN or RecQ protein-like 2. The antibody has been extensively validated for western blotting using whole cell lysates. Rabbit anti Human WRN antibody recognizes human Werner syndrome ATP-dependent helicase, also known as exonuclease WRN or DNA helicase, RecQ-like type 3. WRN is a 1432 amino acid member of the RecQ helicase subfamily containing single HRDC, helicase C-terminal, helicase ATP-binding and 3'-5' exonuclease domains and is implicated in DNA double-strand break repairs, through interaction with Ku70/80 (Li et al. 2004). Defects in the WRN gene are responsible for the rare autosomal recessive premature ageing disease known as Werner syndrome, characterized by age-related disorders including atherosclerosis, osteoporosis, non-insulin-dependent diabetes mellitus, ocular cataracts and cancer (Huang et al. 2006). 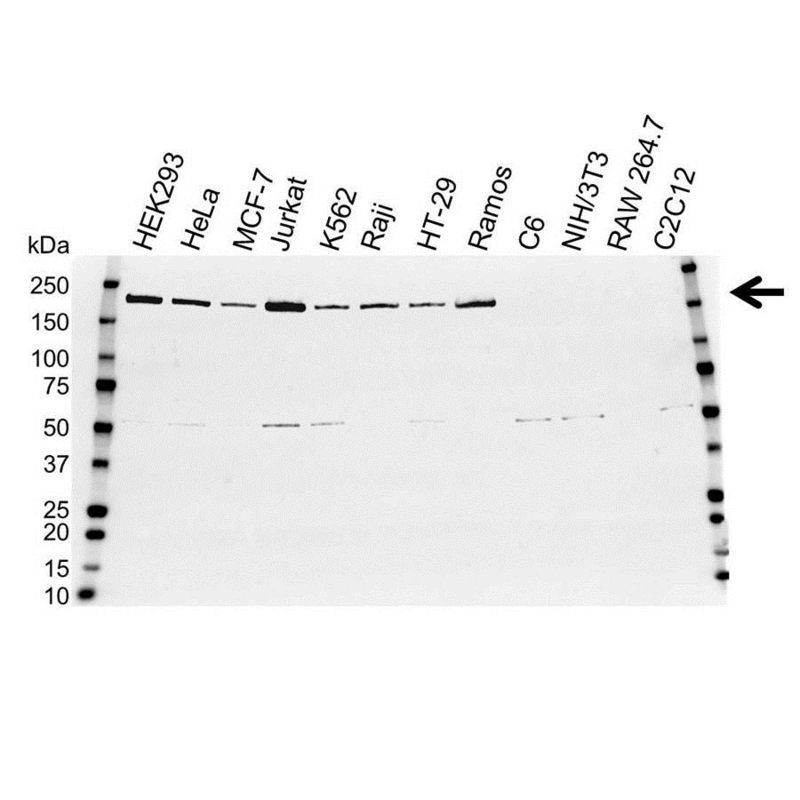 Rabbit anti Human WRN antibody recognizes human WRN as a single ~200 kDa band in HeLa cell line lysates by western blotting under reducing conditions. Anti WRN antibody detects a band of approximately 200 kDa in HeLa cell lysates.